25TH Anniversary Edition! Only 7,300 miles! Investment opportunity! (72) Photos Printable Brochure Apply For Credit Text Us About This Vehicle! Have you been looking to get into a GREAT investment opportunity and have a little fun at the same time? Here is your chance! We believe that this forth generation Firebird / Trans Am is you're chance! 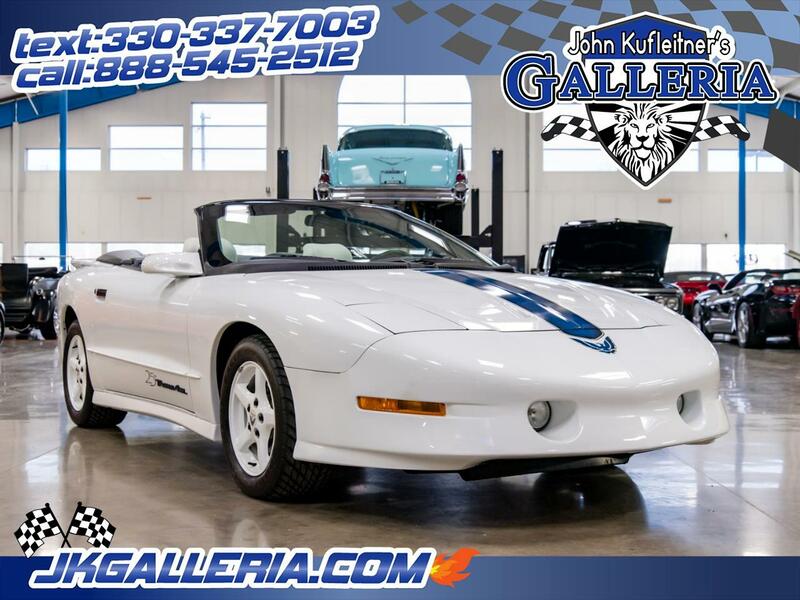 This 1994 Pontiac Trans AM GT 25th anniversary edition is an absolute beautiful addition to anyone's collection, or if you are just getting into classic cars. Either way we think your going to love this one. This car has an original mileage of ONLY 7,340 miles, and it shows over all in every aspect of this car. From the deep mirror like shine of the original white paint and the signature blue strip. This paint scheme was to commemorate the first generation when Trans AM got its start in 1970. The 1994 Trans AM was the only year that Pontiac offered a GT. The GT package included 245/50ZR16 tires and a 155-mph speedometer. While the GT package was a cost option on the 1994 Trans Am, a majority of 1994 Trans Ams were made with the GT package. It also featured white-painted, five-spoke, 16-inch alloy wheels, and white leather seats and door trim. This car is showcasing the bigger of the two drivetrain options with the 5.7 Liter (347.8 CID) LT1 V8 backed up the THM 4L60E 4-Speed Automatic transmission. This car has been serviced and is ready for a cross country trip. We can also assist with shipping anywhere in the world! Message: Thought you might be interested in this 1994 Pontiac Firebird.